Two years ago, Fabienne went to Japan to chase the cherry blossoms for a whole month. She was immersed completely and learned a lot about consumption, nature and the beauty of the moment, but the most about herself. Is it safe to assume everybody has wished to go to Japan to experience the cherry blossom season, at some point in their travel career? Japan is one of the most desired destinations in the world from March to May. And no wonder: entire cities wrapped in a soft pink velvet blanket, thousands of people living to the rhythm of the ephemeral cherry blossom. it is wonderful to see, and trust me, the sakura excitement is real! Yes I’ve done it, I’ve chased the sakura in Japan, and not mildly: a couple of years ago, I came up with a great travel plan. I was going to follow the cherry blossom from south to north for a whole month! I was so excited: it wasn’t my first trip to Japan but that one was going to be purposeful. 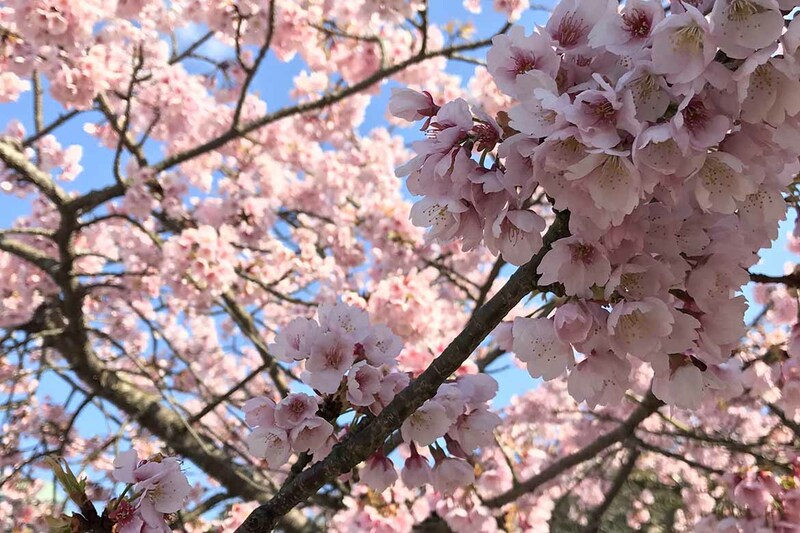 Elaborated upon the official cherry blossom weather forecast (released every year in due time by the Japanese Weather Forecast Association), my plan was to start in Fukuoka at the end of March and end up in Sapporo early May. Spoiler alert: I never made it to Sapporo, and in this story, I’m going to tell you why. First of all, what I can say about the trip to witness the cherry blossom, is that it’s one of the easiest to prepare. Not only is Japan a destination already extensively covered, but the cherry blossom season is such an organized phenomenon nowadays that everybody has written something about the best ways to travel Japan at that moment (including myself), the best places to enjoy the blossom all across the country and any travel agency will have something packaged for you to enjoy the various sakura-related activities. A couple of weeks before, I came up with something like this: a map of Japan where I pinpointed destinations with a pink pen (you’ve got to be in the theme colour!) 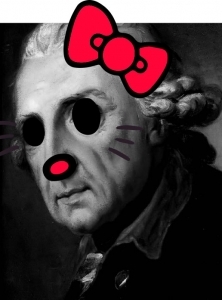 thanks to an excel sheet filled with dates when the cherry blossom was supposed to happen and where. Thus I started to organize the trip following the forecast. The whole operation was pretty straight-forward as all info provided by the Japanese Weather Forecast Association is very specific and besides the fact there was a conflict between Kyoto and Tokyo since the blossom happens almost at the same time in both cities, the sakura chasing was supposed to be a very smooth, unique, beautiful travel experience. The truth about traveling Japan during the cherry blossom is that it is absolutely breathtakingly beautiful but also kind of crazy. That pink velvety blanket we talked about? Well it’s as soft to the eye as the pictures on Google images or Instagram let you imagine. Seeing the sakura ranging from light pink to almost white covering river Meguro in Tokyo? One of the most wonderful landscapes I’ve seen in a city in years of travel. 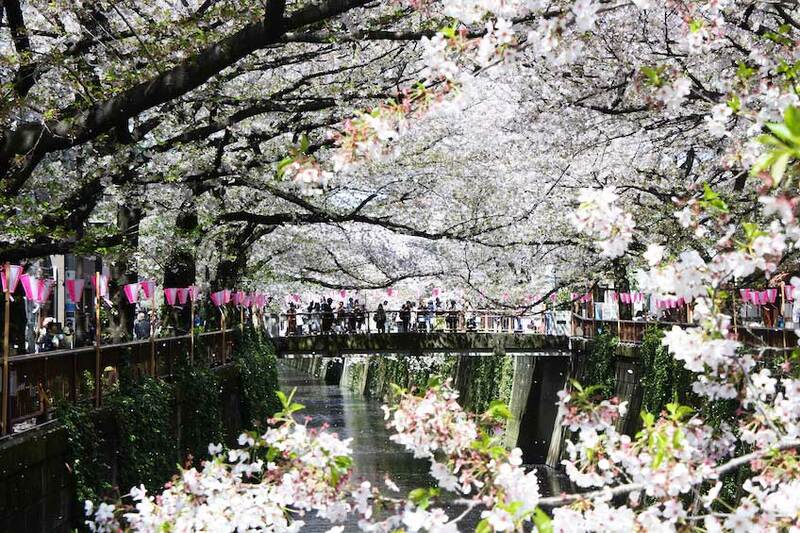 It’s also true that the cherry trees are very artfully organized around cities, shrines and parks all across the country. It has been so ever since they entered the country: those trees cannot reproduce naturally, so wherever you see them, you’ll know that they have been skillfully planted by expert human hands for the pleasure of our eyes only. Japanese people take all of this very seriously and for a whole month, the country’s life is rhythmically paced by the evolution of a tiny pink flower. But when I say the country follows the blossom, I don’t exactly mean it the poetic way we picture as foreigners (or maybe it’s just me and my romantic inside imagery). I mean that the whole economic activity seems to revolve around the blossom: not only will you be surrounded by as many tourists as the Japanese land can hold, taking pictures of a single flower in bloom and sometimes even mistaking plum flowers for cherry ones ; you will also most likely stand bewildered at how many goodies it is possible to create – and sell – from a small single flower, precisely. 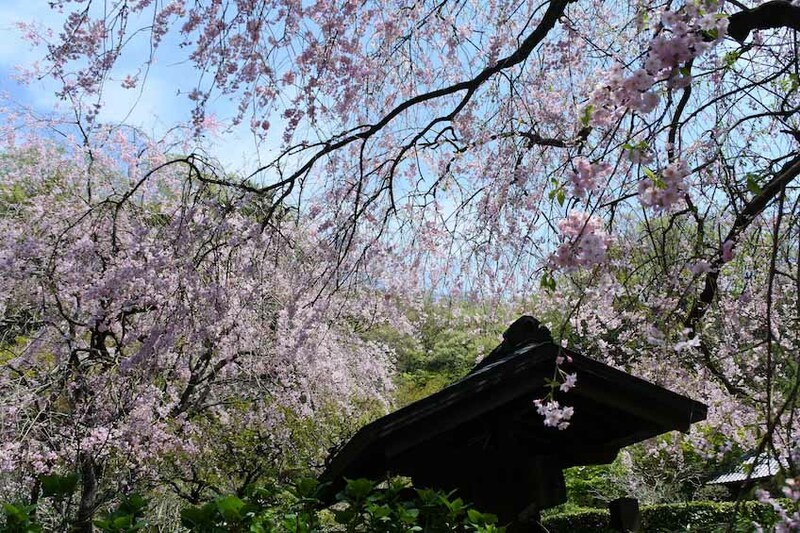 The myth around the sakura blossom is actually not mythical at all: it is very real. Very real especially in the fact you can buy almost everything cherry blossom-related. 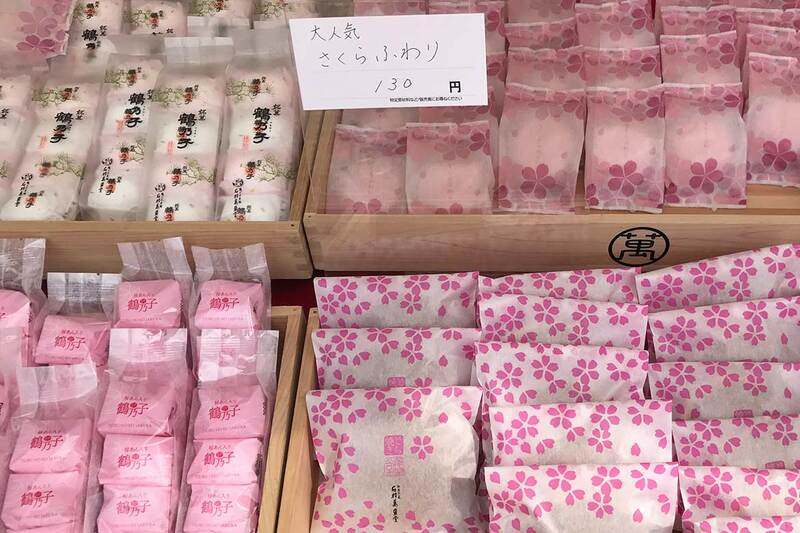 I’ll start with food: you can try sakura yatsuhashi, sakura dorayaki and other derived sakura wagashi (traditional pastries), sakura hanazuke (an infusion of sakura flowers). “Sakura mochi” is the most popular sweet related to the cherry blossom season but the truth is that you will most likely be eating “sakura domyouji”, the Kansai version of mochi, wrapped into a cherry leaf, since the traditional mochi is theoretically not available anymore when the sakura season is on. But who cares about accuracy? 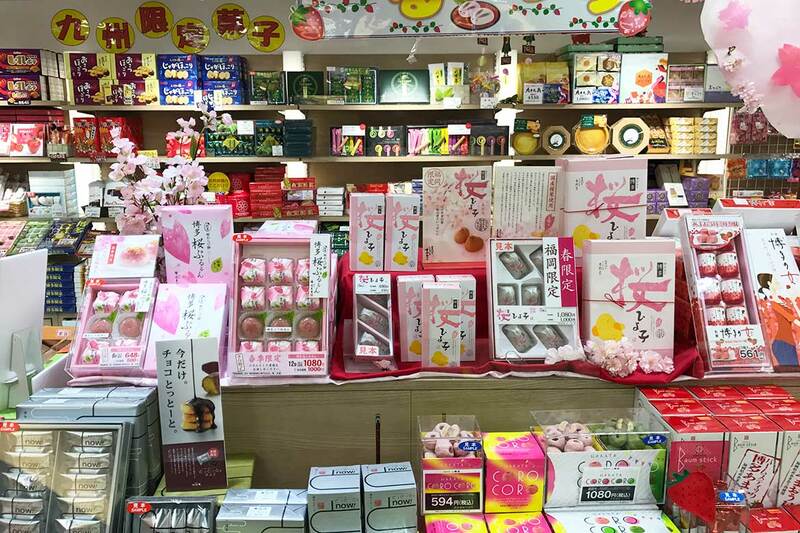 Besides food, you can buy everything pink, from accessories to children’s toys, and all the shops are decorated with artificial sakura, even those that don’t sell cherry blossom-related products – and that, way, way in advance. 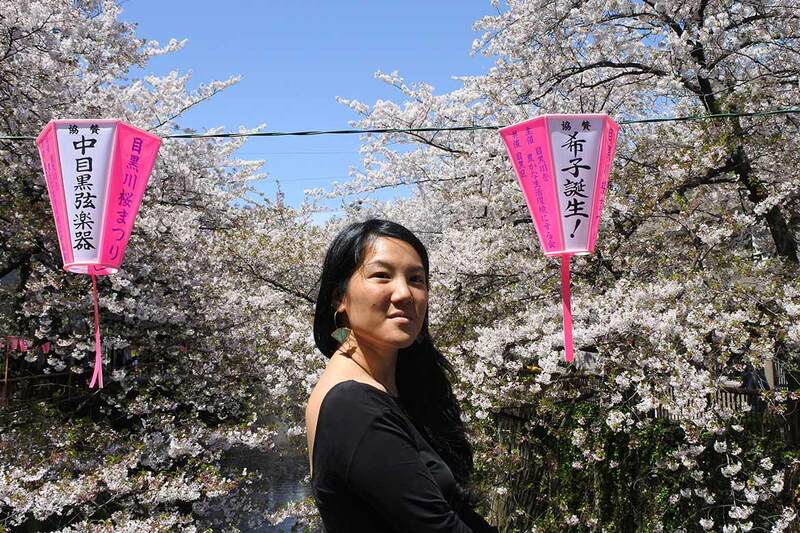 All this to say that for a tourist, there is no cherry blossom experience in Japan without all the commercial hustle-and-bustle, especially if you go on a short trip. But I didn’t! So, you will ask me: what was it like to be able to view it in several cities and over such a long time? Did it make it less crowded? Less frantic? Less commercial? To be honest, the only reason I could eventually enjoy the sakura chase was that nothing went according to plan. 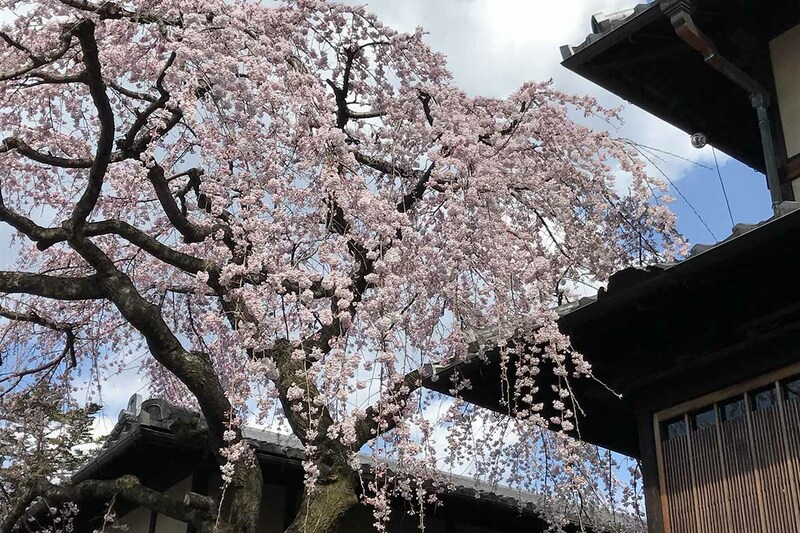 And, like in most trips, it was those bits of unexpected that allowed me to take a very tiny itsy-bitsy glimpse at attempting to understand the real relationship Japanese people have with the cherry blossom. What didn’t go so right is that despite a very meticulous planning, there would still be one thing you can’t control and I guess I had managed to forget about it. 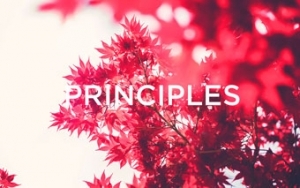 In my mind, everything related to Japan is so organized, so planned and always fall into the right place… so I forgot that we were dealing with nature and that whatever you do and however bad you want it, nature will not bend for you. Well the sakura blossom was late that year. Spring had been colder than usual and the flowers wouldn’t bloom! So there was no flower, everybody was very expectant and nothing was happening – which was a little bit funny, all things considered. Some people would still hold a hanami under the one tree in bloom in the middle of the park, resulting in an awkward scene of blue plastic mats surrounding an odd pink post and dozens other bare trees. So what should you do when you’ve already planned everything, booked transportation and accommodation in each city for your whole family who decided to join you on a part of that trip? To say that my Mum had high expectations towards me for her first trip to Japan is an understatement. Well, in that case, when pressurized by family and money, let me tell you: you do what you have to do and follow your itinerary as if everything was ok! Looking back on it, I can’t help remembering my first trip to Mount Fuji when I stayed stuck in a small mountain train station because of torrential rains caused by a typhoon swiping the country. That experience had made me understood the extent of Japan’s exposure to natural phenomena and opened up a door on the reasons why the Japanese believe the kami (Shinto deities) live in everything around us: it did feel like all natural elements had a will of their own. And the cherry blossom that time should have reminded me of that too. … let the kami make a better plan for you! As I mentioned before, whenever you are planning to do such a sakura chase from south to north as I did, you will have to face this conflict between viewing the blossom in Kyoto or in Tokyo. The two cities being on roughly the same latitude, there is no good solution to it, unless the gods decide otherwise. And you should always trust them, because in my experience, they perfectly know what they’re doing: we didn’t see the sakura in the gardens of the Kiyomizu-Dera, but then Kyoto was also the craziest city in terms of crowd, prices and tourist sale at once. However, by the time we reached Tokyo a week later… the sakura were in full bloom! And I have honestly not enjoyed anything else as such a gift as the blossom in Shinjuku park, among oldest Japanese taking a stroll or younger photographers armed with big cameras trying to catch the exact angle on a perfect sakura flower. I also mentioned earlier that I never reached Hokkaido as planned, and I haven’t told you why yet. This is the second thing that I enjoyed the most in that trip, and possibly the most important lesson I learnt from the sakura season in Japan: all this unexpectancy and the tiredness of chasing had lead me back to being my old relaxed-traveler self again. At some point, when you’ve been trying so hard to keep everything under control, you will have to let go in order 1) not to implode and 2) to embrace properly what the journey has to give you – and the moment you do it, I swear you will be able to receive it. 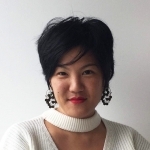 Once in Tokyo, I let go of everything and it opened the way for an encounter with an older artist and poet who, in the most discreet, quiet and elegant way that only the Japanese sustain, took me by the hand and introduced me to the real meaning behind the sakura blossom… and actually, any blossom. Towards the end of the sakura season in the area, he led me through temples and gardens in Kamakura (it’s a smaller sea-side city 1 hour away from Tokyo by train). There was almost no cherry flowers left, but there was still one thing to observe: fubuki. Fubuki describes the moment when the flowers are becoming so fragile that a gush of wind is enough to fly them away. It is the literal illustration of “gone with the wind”. 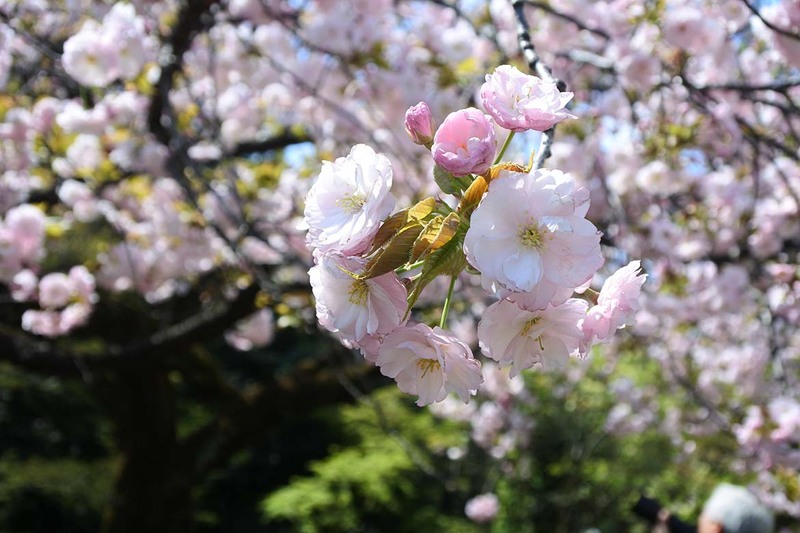 It can last for a couple of minutes only, until an entire part of the cherry tree is left flowerless with only the tender green of the leaves sprouting, announcing summertime in the region. If you happen to not be looking at the right moment, you have missed fubuki until next year. 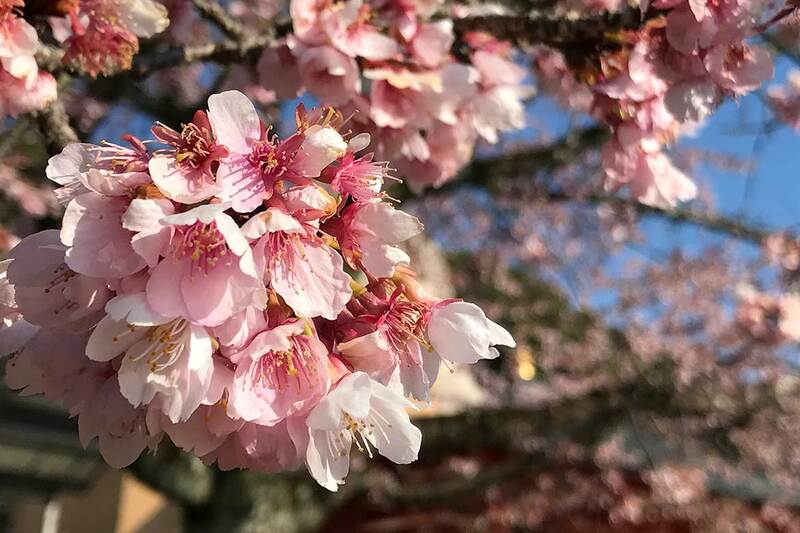 As I stood mesmerized by the dance of light pink petals in the wind, I felt it was the rightful conclusion to my sakura chase: all expectations swiped away in minutes, the release of a tension that had been holding an entire country (and myself) altogether for weeks. With fubuki, the climax of spring disappears and makes way for the renewed energy of an upcoming year. This is how I put an end to my sakura chase in Japan. And realizing I didn’t have to see the blossom anymore because that wasn’t really the point after all, was probably the most significant and wonderful moment of that journey.